Inspired by a European study, a team of Stony Brook University researchers looked into the potential impact of healthy human skin tissue (in vitro) being exposed to ultraviolet rays emitted from compact fluorescent light (CFL) bulbs. The results, “The Effects of UV Emission from CFL Exposure on Human Dermal Fibroblasts and Keratinocytes in Vitro,” were published in the June issue of the journal of Photochemistry and Photobiology. The researchers, led by Miriam Rafailovich, PhD, Professor of Materials Science and Engineering and the Director of the Garcia Center for Polymers at Engineered Interfaces at Stony Brook, conducted similar research to a European study on Light Sensitivity. Stony Brook researchers collected CFL bulbs purchased from different locations across Suffolk and Nassau counties, and then measured the amount of UV emissions and the integrity of each bulb’s phosphor coatings. Results revealed significant levels of UVC and UVA, which appeared to originate from cracks in the phosphor coatings, present in all CFL bulbs studied. At Stony Brook’s Advanced Energy Research and Technology Center (AERTC), the team took the same bulbs and studied the effects of exposure on healthy human skin tissue cells, including: fibroblasts, a type of cell found in connective tissue that produces collagen; and keratinocytes, an epidermal cell that produces keratin, the key structural material in the outer layer of human skin. Tests were repeated with incandescent light bulbs of the same intensity and with the introduction of Titanium Dioxide (TiO2) nanoparticles, which are found in personal care products normally used for UV absorption. “Our study revealed that the response of healthy skin cells to UV emitted from CFL bulbs is consistent with damage from ultraviolet radiation,” said Professor Rafailovich. “Skin cell damage was further enhanced when low dosages of TiO2 nanoparticles were introduced to the skin cells prior to exposure.” Rafailovich added that incandescent light of the same intensity had no effect on healthy skin cells, with or without the presence of TiO2. The research, funded by the National Science Foundation, was a collaboration of Stony Brook University and New York State Stem Cell Science (NYSTEM). Co-authors of the study include: Dr. Rafailovich; Dr. Tatsiana Mironava, Adjunct Faculty, Department of Chemical and Molecular Engineering, Stony Brook University and Senior Research Support Specialist, NYSTEM; Dr. Michael Hadjiargyrou, Professor, Department of Biomedical Engineering, Stony Brook University; and Dr. Marcia Simon, Professor, Department of Oral Biology and Pathology, Stony Brook School of Dental Medicine and the Director of the Living Skin Bank at Stony Brook. CFLs are inferior in EVERY way to LED lighting. 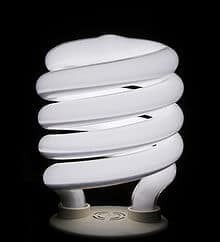 CFLs not only emit these damaging rays to skin, they also contain mercury and require special removal instructions. CFLs NEED TO GO. As soon as LED technology (CRI is already as good as CFLs) and price, LED will be the king. What about cataracts ? If CFLs are dangerous enough to cause skin cancer, then they cause cataracts too, no doubt. Was very alarmed by this article you reference in THE DAILY CALLER. Unfortunatley (or maybe fortunately, since I have these bulbs throughout my house) it is a hoax. The article mentioned does not appear in the June edition of the magazine quoted (nor any other as far as I can find) and the quoted professor, while a real person, is a professor of plastics and not of photo biology, and she does not have an article in any edition of the magazine. Alarming stuff, but not true. Perhaps to get some peer review comment that might support/ reject actual inclusion in Journal ! Thanks for pointing me to the article. Your blog, though, states that the journal article appeared in the June issue of the journal, not in an upcoming issue. You might want to make a correction. not emit as much UV rays as do the white onces. How about white LED’S ?? That’s what I was thinking too Leds people tend to neglect all the side effects of using CFL but LEDs they do not contain any hazardous materials and are mercury free. Basically, bulbs are the wrong way to use fluorescent lighting technology, best in long tube form, just like LEDs have natural lighting advantages in sheet form.